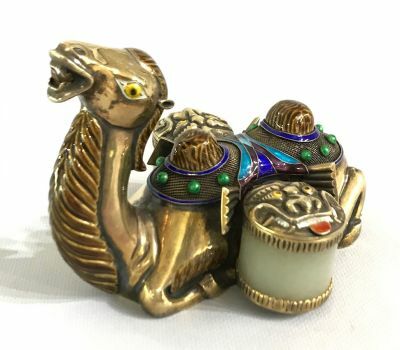 Chinese silver gilt inkwell in camel form. The side saddle containers (the inkwells) are white jade. The saddle and mane details are in enamel. The piece is marked Silver on the base. Chinese origin, early 20th century. 4 1/2” by 3 5/8”, 3 3/8” high.